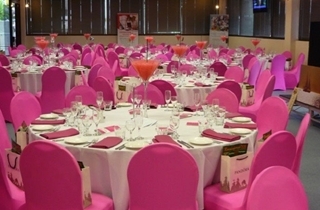 The fun and excitement of a day at the races will set the scene for your wedding day at the Ipswich Turf Club. We have a number of rooms for hire which are suitable for groups between 10 and 170. Upstairs air-conditioned function room. Room capacity up to 200 guests. Downstairs air-conditioned function room. Room capacity up to 200 guests. Paved outdoor courtyard area under the sails. Minimum 30 guests up to 100. Let us take care of your reception for you with the two course dinner Premium Wedding Package. Let us take care of your reception for you with the three course dinner Deluxe Wedding Package. 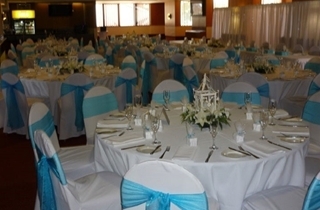 Three course alternate selection from the Grandstand Menu or the "I Reign Supreme Buffet"
The Diamond Wedding Package includes pre-dinner drinks, a three course dinner and, as a gift to the Bride and Groom, one nights accommodation at the Metro Ipswich International Hotel. Three course alternate selection from the Grandstand Menu or the "Quality Kingdom Buffet"
Host your wedding in a spectacular marquee with dance floor and a three course dinner and, as a gift to the Bride and Groom, enjoy one nights accommodation at the Metro Ipswich International Hotel. Exclusive use of the Saddling Enclosure for the ceremony and the ITC premises for photos.